NEWPORT BEACH — Eelgrass, a native sea grass that has a reputation among dock owners of making dredging an onerous and expensive undertaking, appears to be thriving in Upper Newport Bay — and that’s a good thing for boaters. “In order to be able to dredge when we need to, we need a good amount of eelgrass in the bay, to balance out what is being removed,” said Amanda Bird, Orange Coastkeeper’s Marine Restoration coordinator. Now in its second phase of a four-year venture, the Orange County Coastkeeper’s Upper Newport Bay Marine Habitat Restoration Project looks to do just that, as it consists of collecting eelgrass growing naturally in the lower bay and transplanting it to the upper bay. The goal of this project is to enhance natural growth in the bay,” Bird said. The city is currently working to incorporate the Eelgrass Protection and Mitigation Plan for Shallow Waters in Lower Newport Beach (also called the “Newport Specific Plan”) into the new RGP-54 permit. The Newport Specific Plan would be used as an alternative approach to the Southern California Eelgrass Mitigation Plan (SCEMP), which calls for a 1.2:1 ratio of new eelgrass to be planted in place of damaged eelgrass, following dredging or other projects that impact the seagrass mitigation plan. It would work off a “threshold” plan that would identify a specific amount of eelgrass in Newport Harbor’s shoreline and dock areas that would be deemed healthy or acceptable for the harbor. Once a healthy or sustainable amount of eelgrass has been identified for the harbor, dredging and dock replacement activities could occur without mitigation measures, as long as the “threshold” level of eelgrass maintained in the harbor was not lowered. To ensure the bay is maintaining adequate eelgrass numbers, volunteers worked from 9 a.m.-2 p.m. July 22-July 26 preparing eelgrass from the lower bay for planting in the upper bay. Scientists and volunteers used three planting methods. Transplanting Eelgrass Remotely with Frames (TERFS) involved lowering eelgrass from a boat to the restoration area. Buoy-Deployed seeding (BuDS) involved removing the flowering portions of the plants and placing them into mesh bags. The bags are then tied to a buoy on the surface of the water, and then anchored to the seafloor using concrete blocks. 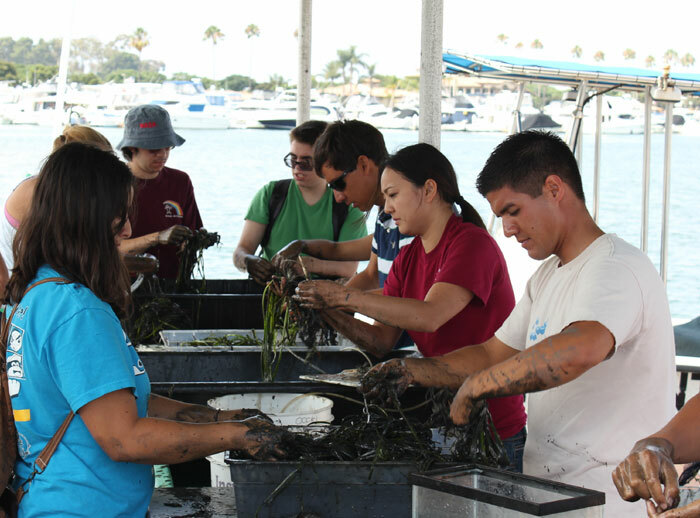 Volunteers helped bundle eelgrass collected from nearby plant beds and then separated them into bundles. They hand tied them together before the bundles were transported to the restoration site. Although it can be a nuisance for boaters and dock owners, eelgrass plays an important role in the ecological system. “It is an important part of health to the bay, because it supports the fish that boaters fish for, helps promote water clarity and provides oxygen for the water and air we breathe,” Bird explained. The ecological benefits of restoring eelgrass are an increase in diversity and the abundance of species native to the Newport Bay estuary. A healthier ecosystem will also restore the value of Upper Newport Bay as a recreational and commercial fishery habitat, according to Coastkeeper. The Upper Newport Bay Marine Habitat Restoration Project originated out of a need for more data on effective and management methods for eelgrass in the upper bay after the vegetation began to decline. Between 2008 and 2011, the agency received funding from the city of Newport Beach, the California Coastal Commission and the U.S. Environmental Protection Agency Environment Education Grant Program to implement the program at the Back Bay Science Center, in partnership with the California Department of Fish and Wildlife. This restoration project is coordinated by Orange County Coastkeeper, in partnership with Rick Ware, president and senior marine biologist of Coastal Resources Management Inc., and the Department of Fish and Wildlife staff at the Back Bay Science Center in Newport Beach. The first phase of the project saw more than 150 bundles, 20 TERFS frames and 20 BuDs Buoys transplanted, restoring 200 square meters of eelgrass in the upper bay. An additional 400 square meters of eelgrass was planted this summer. “We are now looking for additional funds to expand it to other parts of the upper bay,” Heimstra said. Bird and fellow scientists will continue to monitor the beds, looking specifically at the total area cover and density, water quality and light transmitted through the water column, which is required for eelgrass to grow.